Welcome, Trojans! Well, we do have a difficulty with this yearbook - it was an Office Copy, and I'm sorry to have to say it was missing most of the Seniors! If you are a '98 graduate, I hope you will consider contributing scans of pages 3-16. Please contact us using the email link if you can help! 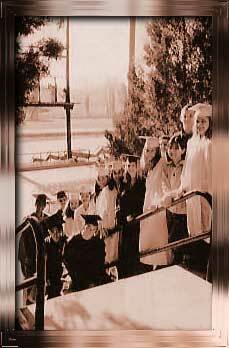 I thought the '97 graduating class was small with only 24 graduating, but in 1998 there were only 16 graduating Seniors! Still, a big year dominated by community service, with a clothes drive, donating eyeglasses to Turkish students, campus beautification by the Student Council, refurbishing of the Teen Club by the National Honor Society, and other fund-raising activities. Visits to the Roadhouse Rock Café and a trip for selected students to the 1998 Creative Connections Workshop in Oberwesel, Germany were highlights. You're sure to enjoy browsing this book! Thanks to Anita Donohoe '66 for donating this, one of a collection of eight yearbooks, to the e-Citadel project! Thank you, Anita, for giving us all back some fond memories that are only ever a click away! And as always, thanks to the 1998 yearbook staff for giving us such a great book!